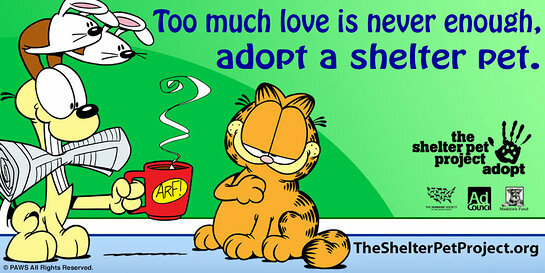 In the interview – by James Hettinger of Animal Sheltering magazine – Jim Davis talks about how he hopes Garfield can help end animal homelessness. It was such a perfect fit for the characters. Both Garfield and Odie were abandoned by their owners — Garfield was left to fend for himself in an Italian restaurant before he was eventually adopted by Jon Arbuckle, and Odie was left behind by his owner, Jon’s former roommate, Lyman. (There are various theories on what became of Lyman.) The characters have enjoyed all the comforts of home, and they hope to help their fellow pets enjoy the same.